I thought it was about time to share a few more updates on Willow with you. Lets just start with talking about how big she is. Now, I'm not entirely sure what her exact weight is, but she's definitely close if not heavier than 20kg now which is absolutely insane. Sometimes I look at her and think she looks quite small but then again I look at her on other occasions and can see how big she's really getting. Willow has decided it's not time for a new adventure in her training and she has taught herself how to not only step on our kitchen chairs, and sit on them, but she can also jump onto the kitchen table and find any chocolate which has been left on there. Don't worry about anything else that's on the table, she just wants the chocolate. This girl definitely has a sweet tooth. I cannot lie, I absolutely love a large breed dog as much as I love the tiny little lap dogs like my little jacks! I come home from being out and she's so happy to see me, that she places her feet on my shoulders consistently until I pick her up. She's finally a cuddly dog! However, I can't moan about this because I love it just as much as she probably does! Unfortunately Willow has decided she reaaally doesn't like people anymore. If she sees someone who's trying to give her a fuss, she'll put her hackles up and back away from them. If anyone struggles with this issue with their dog, I'd love to know how you try to help them because we don't have a clue! 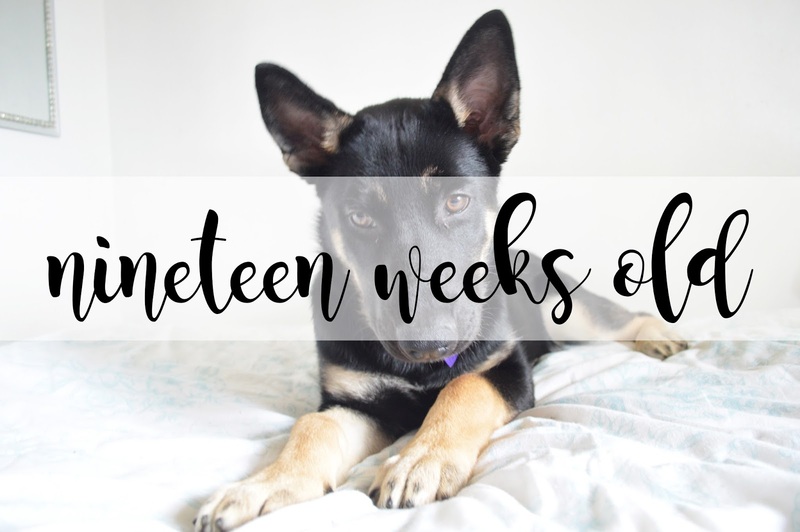 If you're interested in seeing regular updates Willow, I try to post over on her instagram account on a daily basis, if not it's every other day! It's incredible seeing how quickly she's growing through the amount of pictures I take of her! You can find her account here! Oh your Fur Baby is beautiful! I love her name Willow! I will be looking forward to more updates on Willow! So cute! We have an elderly dog. I'm not a dog person but my partner already had him when we met, now he feels like family! awwww so cute! Hope she didn't eat too much chocolate poor thing! My god is a small dog so its insane seeing a big dog at only nineteen weeks! haha such a cutie! When dogs put their hackles up its usually because theyre either fearful or excited, theres probably some youtube vids that can help maybe?